Cleveland, Ohio — Operation Rescue has obtained a 911 recording and Computer Aided Dispatch transcript that indicates a patient of Preterm, a Cleveland, Ohio, abortion clinic, has died. Pastor Dale Henkel was on the scene and took video and photos of the incident, which have been released by Operation Rescue in a video that also features the 911 audio. He told Operation Rescue that the patient was African-American, as are about 80 percent of the high-volume clinic’s abortion business. The video clip showed that emergency workers were not performing any kind of treatment on the woman as she was wheeled on a gurney to the awaiting ambulance. There appeared to be a small towel over the woman’s face. As a matter of practice, paramedics or EMTs do not pronounce death at the scene, but instead transport the victim to the hospital where a physician can pronounce a time of death. Pastor Henkel told Operation Rescue that after the ambulance left the Preterm abortion clinic, it was followed by a woman thought to be a nurse wearing blue surgical scrubs, the office manager, and a man believed to be abortionist Mohammad Rezaee. This is not the first abortion complication recorded at Preterm. 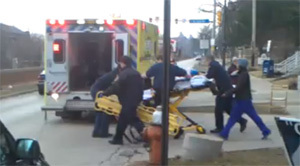 On April 13, 2013, activists photographed clinic escorts loading an injured abortion patient into a private vehicle for transport to an unknown location. “It’s ironic that the abortion cartel has complained so loudly about the new abortion clinic standards in Ohio. Based on Friday’s incident, it appears that the regulations aren’t strict enough,” said Newman.